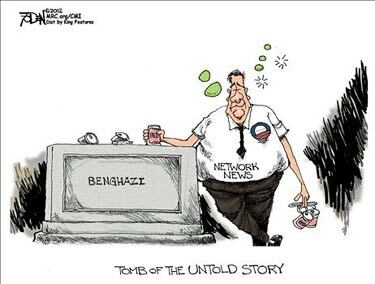 Yesterday, CBS News was the first of the Lamestream Media to break the deliberate establishment press boycott on pre-election coverage on the Benghazi debacle, actually publishing a leak from inside-government sources disadvantageous to the Obama Administration. Today, Jake Tapper of ABC News commented venomously on the Administration’s stonewalling and endeavored to depict ABC as a vigorously investigating news organization. In the place of a detailed description from the Obama administration about what happened more than six weeks ago comes the drip-drip-drip of stories about the failures of the Obama administration to provide those Americans on the ground in Libya with all the security assets they needed. Hurricane Sandy’s arrival on the East Coast was a godsend for the establishment media and Barack Obama, filling up the front page columns and dominating TV news coverage for several crucial days just a week before the election. But the hurricane is now over, there are still four days to go, and the Benghazi story continues, bit by bit, to leak out. Andy Rooney was old, but he could effectively argue the superiority of his old manual typewriter over those newfangled personal computers that replaced them. House Speaker John Boehner made it clear in a speech to small business owners at the University of Cincinnati Monday that he is not in sync with the president’s plan to raise the tax rates of the wealthiest Americans. “Giving the federal government more money would be like giving a cocaine addict more cocaine,” the West Chester Republican told about 100 members of the Goering Center for Family and Private Business at UC’s Alumni Center. 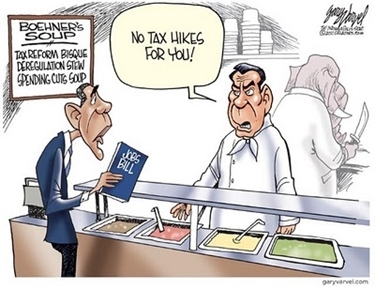 Obama knew perfectly well that the Republican-controlled House would never go along with an any-prospects-of-recovery-killing plan to raise taxes on the only sector of society capable of new investment and new job creation. What Obama was doing was affirming his commitment to left-wing orthodoxy by embracing class warfare as an attempt to appeal to voters’ worst impulses. The president unleashes his inner Alinksy this morning with the release of his proposal for massive tax hikes, mostly on high income earners, accounting tricks and childish rhetoric. It is clear he has decided to run hard left in 2012, with all the tiresome cliches that involves. The plan is a sham of course, an election year set-up just like the absurd demand in the Joint Session of Congress for Stimulus 2.0. This new, new plan isn’t dead upon arrival; it was dead before sending. And everyone knows it. Politico’s Mike Allen details the massive spin put on the highly partisan plan last night by the president’s tap-dancing and desperate team, but no one is fooled. Everything the president ever said about “working across the aisle” is trashed. The Chicago way is in the saddle. It’s the only way he and his advisors know. The very good news is that the country knows, even if the MSM doesn’t. (CBS/AP) WASHINGTON — House Republican leaders say they are rejecting President Barack Obama’s jobs proposals to rebuild schools and blighted neighborhoods, and help keep state and local employees on the job, and cure cancer and help the lame walk again, and find good homes for puppy dogs and kitty cats, and take a sunrise and sprinkle it with dew and cover it with chocolate and a miracle or two, and teach the world to sing in perfect harmony, and grow apple trees and honey bees and snow white turtledoves, and slow the rise of the oceans, and begin to heal our planet. What Happened to Newsweek, CBS, and CNN? Ed Driscoll rubs in the fact that the Internet changed the news and information business permanently, causing establishment media outlets like Newsweek, CBS, and CNN, all notorious for partisan reporting, to wonder where their audience went. Can they possibly lose any more credibility than they have already? The McCain Campaign produced a web-ad response to Senator Obama’s “lipstick on a pig” remark. This video is no longer available due to a copyright claim by CBS Interactive Inc.
CBS actually is so in the tank for Obama that it would stoop to interfere with a 30 second video rebuttal. Pathetic. BARACK OBAMA: Well, you know, you can, you know you can…put…uh…lipstick on a pig…it’s still a pig. CBS’ KATIE COURIC: One of the great lessons of that campaign is the continued and accepted role of sexism in American life. In an interview with CBS’s Bob Schieffer, Hagel expansively speculated about running as a Third Party candidate, a move he predicted would be good for the American political system. Schieffer then turned the conversation to discussing prospects of a joint run with New York City’s Anti-Gun-crusading, Anti-Nicotine-Nazi Mayor Bloomberg. Hagel was delighted by the idea, and grew misty-eyed over the generosity of the America which could offer such opportunities to some very rich and powerful “boys” from Nebraska and New York. As John Wayne used to say: That’ll be the day. James Lewis reports that, with Mike Wallace playing sycophant, on Sunday night Iranian president Mahmoud Ahmadinejad will threaten the president of the United States with death on national television if he fails to convert to Islam. If CBS had a real American at that interview, he would have stood up and struck Ahmadinejad in the face for his insolence. I have no trouble picturing how Andrew Jackson or Theodore Roosevelt would have responded to such a threat. Indeed, the flagship CBS News production languishes at the bottom of the network news heap, with a mere 10 percent share of a rapidly-dwindling audience of increasingly-older viewers — average age 61.2 years. the Archives of Never Yet Melted in the 'CBS' Category.